Not to be confused with Life Mushroom. A green, white, and beige mushroom with eyes. 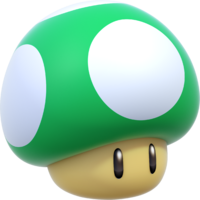 1-Up Mushrooms are green mushrooms that give the player an extra life. They are usually the rarest mushrooms, but can still be found in almost every game a Super Mushroom has appeared in, and even some it has not. 1-Up Mushrooms are usually found in hidden blocks or in risky places for the player. They always grant the player a positive effect when acquired. 1.1.8 New Super Mario Bros. The 1-Up Mushrooms first appear in Super Mario Bros. In this game, they have green spots on a yellowish-orange mushroom cap. They are usually found in Hidden Blocks or in areas where Mario must risk his life to acquire one. They are rather uncommon in this game; the ones in the worlds' first levels can only be earned by grabbing all the coins of the previous world's third course. In World 1 and World 8, however, there are two hidden 1-Up Mushrooms, more than Mario can find than any other world in the game. The 1-Up Mushroom, along with the Super Mushroom, reappears in Super Mario Bros.: The Lost Levels. Due to this game being a direct sequel with very few graphic changes, nothing changed over the behavior of the 1-Up Mushroom, though like the Super Mushroom and the newly introduced Poison Mushroom, these mushrooms now have eyes, which continue to be present in most installments afterwards. While 1-Up Mushrooms are present in Super Mario Bros. 2, these versions are also simply known as 1 UPs and look very different from the usual green-capped mushrooms. Found by pulling up a plant containing one or throwing three items at a bubble containing a 1 UP (in Super Mario Advance only), they have a solid red cap with "1 UP" written on their side, rather than having eyes. As usual, they grant an extra life. 1-Up Mushrooms reappear once again as rare mushrooms that can be found in hidden blocks or in risky places in Super Mario Bros. 3. Their behavior has not changed much, but they now have light-blue or green-spotted white caps (these cap colors are reversed in remakes), though in the NES version, a pure white 1-Up Mushroom can be found in World 6-3. Extra lives are also regularly obtained via the card system, as well as the Spade Panels. Giant ? Blocks in bonus rooms can also give three 1-Up Mushrooms. Super Mario Advance 4: Super Mario Bros. 3 allows one to scan 1-Up Mushroom cards to gain extra lives as well, ranging from one to 100 extra lives. An unreleased switch card could also make every block with 1-Up Mushrooms give three of them instead (with the Giant ? Blocks giving nine of them), and the Blue Switch turns all 1-Up Mushrooms in normal-sized blocks into 3-Up Moons when activated. In Super Mario World, 1-Up Mushrooms (also called Extra 1-Up Mushrooms or Extra Mario Mushrooms), with the now-standard white-spotted green cap, behave as they do in Super Mario Bros. 3, but can be found in a more varied range of places. Fishin' Lakitus carry them as bait for Mario, and when Mario acquires it, the Lakitu will chase after Mario, throwing Spinies after him. 1-Up Mushrooms also appear out of eggs when Mario is already riding a Yoshi and hits a ? Block containing an egg. Certain bonus rooms also have rows of ? Blocks within floors, and these blocks will award Mario with 1-Up Mushrooms if he hits them in the right order. Getting 100 Goal Stars from Giant Gates will send Mario to the Bonus Game, where he must hit eight moving and scrolling blocks to match Super Mushroom, Fire Flower, or Super Star icons with the stationary one in the center. Every three-of-a-kind match will give him a 1-Up Mushroom, and he can win up to eight of them if all the icons match. There is another item in Super Mario World that can grant Mario lives — the 3-Up Moon, which gives Mario three extra lives instead of one, but is even rarer than the 1-Up Mushroom and is only found in hidden areas, such as behind the Giant Gate in some levels. A flying winged golden 1-Up Mushroom exists unused in this game. Appearing differently from its previous design, 1-Up Mushrooms in this game are green with yellow spots. They are also the only mushrooms that can be obtained in Super Mario 64. They can be found in a number of places, such as after going through or collecting a ring of coins. 1-Up Mushrooms are also found in hidden areas or on top of poles. Most will seemingly slide away from Mario, while others follow Mario until he collects it. Others are static, and Mario can simply run up to the mushroom and collect it. A 1-Up Mushroom can also be found in the room with the Jolly Roger Bay painting. Also, three 1-Up Mushrooms can be found at the top of Peach's Castle if the player uses the cannon to reach there. In some stages, some 1-Up Mushrooms may appear in a small field of flowers. Touching or punching certain butterflies may also spawn 1-Up Mushrooms, though others spawn homing bombs instead. Others appear in some ! Blocks in some missions. In Super Mario 64 DS, they are the most common mushroom, as Super Mushrooms were added in this version, and they share their design from Super Mario Sunshine and Mario Kart: Double Dash!!. They share the same role in this game and appear in the same places, though a few have been removed from locations in the original game or act differently from what their original counterparts acted like. Like the original game, some will try to run away from the player, others follow the player until he gets a life, and others are also static in one area. Unlike the original game, the word "1-Up" will appear after collecting the mushroom. A 1-Up Mushroom from Super Mario Sunshine. 1-Up Mushrooms reappear in Super Mario Sunshine. They look very similar to their appearance in Super Mario 64. They are the only type of Mushroom that can be acquired in this game. Aside from gaining an extra life, Mario's health meter and F.L.U.D.D. 's water tank will also be completely refilled upon collection. Some 1-Up Mushrooms try to escape from Mario after they're found, while others can be collected easily. Stomping a Bull's-Eye Bill in the final battle may award a 1-Up Mushroom. Little has changed in the behavior of these mushrooms in New Super Mario Bros. when compared to Super Mario Bros.. However, they can be obtained by collecting a Mega Mushroom and destroying a certain number of objects in the player's path. When this action is completed, a number of 1-Up Mushrooms will fall from the sky, determined by the amount in the meter at the top of the screen (5 1-Up Mushrooms is the maximum amount that can be earned this way). They can also be obtained by getting all the Red Coins from Red Rings when in Fire or Shell form. One card with three 1-Ups. One card doubling the amount already collected. A card with Bowser's face on it. The game ends once it is hit, or if it hasn't been collected but the other five have. The 1-Up blocks already bashed will give the player their extra lives. 1-Up Mushroom from Super Mario Galaxy. 1-Up Mushrooms act very similar in Super Mario Galaxy and Super Mario Galaxy 2 when compared to the games in the past. However, they are found in other places such as the bottom of planets or next to black holes. When the player also touches all notes activated by a ? Coin, a 1-Up Mushroom will often appear. The player can also get a 1-Up Mushroom from Lumalee for 30 star bits on certain galaxies, particularly before some boss fights. Five 1-Up Mushrooms can be found on the Comet Observatory. When Mario receives a letter from Princess Peach via the Mailtoad, five 1-Up Mushrooms will be included with the letter. When playing as Luigi, 20 1-Ups will be included instead of five. 1-Up Mushrooms act in a very similar manner in New Super Mario Bros. Wii when compared to New Super Mario Bros.. 1-Up Mushrooms are pretty rare in the levels and they are usually hidden well. They can also be obtained by getting all the Red Coins from Red Rings when in Fire, Ice, Propeller, or Penguin form. The 1-Up Toad Houses return with a new minigame, 1-up Blast, in which the player must hop into cannons and shoot the cannon at balloons with numbers ranging from one to four. If the player pops these balloons, the number of lives shown on them will be received. Additionally, landing on eight Para-Beetles or Heavy Para-Beetles in row will award a 1-Up Mushroom. 1-Up Mushrooms also appear in Super Mario Galaxy's sequel, Super Mario Galaxy 2. They have the same benefit like in the predecessor — each mushroom gives Mario an extra life. Teleporters can send Mario to areas where he earn three to five 1-Up Mushrooms by defeating all the enemies present in a short time. The notes that Mario collect often make 1-Up Mushrooms appear, usually three. Mario can also obtain 1-Up Mushrooms from Lumalee, on Starship Mario, or from Chance Cubes, with some Chance Cubes having the chance of rewarding up to five 1-Up Mushrooms. 1-Up Mushrooms return in Super Mario 3D Land and function the same as they do in any other Mario game. 1-Up Mushrooms also appear in New Super Mario Bros. 2. They are replaced by Gold Mushrooms in the Coin Rush mode. 1-Up Mushrooms also reappear in New Super Mario Bros. U and New Super Luigi U. Once again, they give the player an extra life. In the Coin Battle mode, collecting a 1-Up Mushroom rewards the player five coins. In the Nintendo Switch version of the games, New Super Mario Bros. U Deluxe, all 1-Up Mushrooms within blocks are replaced by 3-Up Moons if Toadette is used. In Super Mario 3D World, 1-Up Mushrooms appear once again and retain their effects from previous games. In Hotel Mario, 1-Up Mushrooms are referred to as Toads. If Fire Mario opens a door that normally hides a Super Mushroom, it will instead hold the identical-looking Toad. A Toad flees faster than a Super Mushroom, and will instead reward the player with an extra life, same as in past games. In Mario & Luigi series, the 1-Up Mushroom revives Mario and Luigi with half of their HP if either Mario or Luigi lose all of their HP in battle. There is also a stronger variant called a 1-Up Super that appears in Mario & Luigi: Superstar Saga and Mario & Luigi: Partners in Time. They are very expensive and are named after the 1-Up Mushroom and the Super Mushroom. When used, it restores all HP (and BP in Mario & Luigi: Superstar Saga) to a fainted Mario brother, whereas the normal 1-Up Mushroom only revives them with half of their maximum HP. It is known as the 1-Up Deluxe in Mario & Luigi: Bowser's Inside Story and Mario & Luigi: Dream Team. Unlike the first game's 1-Up Supers, Mario & Luigi: Bowser's Inside Story's 1-Up Deluxes do not restore SP, the equivalent of BP in the first and fourth game of the series. In Mario & Luigi: Paper Jam, its name is shortened to 1-Up DX. Mario & Luigi: Paper Jam also introduces the Double 1-Up Mushroom, which revives two fallen party members, but with less HP than a normal 1-Up Mushroom. In Mario Kart: Double Dash! !, a 1-Up Mushroom appears as an emblem in the front of Toadette's Kart. This kart is supposed to be a recolor of the Toad Kart, which is blue and sports a regular Mushroom as an emblem. The 1-Up Mushroom does not appear as Toadette's emblem in later games, however, likely owing to Toadette's face being used as her emblem throughout many spin-offs. A 1-Up Mushroom represents the Mushroom Bridge track logo as well. Although they do not appear as items in Mario Kart Wii, in the track Coconut Mall, there is a shop in a hidden shortcut that is selling 1-Up Mushrooms along with other classic Mario items. The sponsor 1-Up Coffee uses a 1-Up Mushroom on its logo and references it in the name. In Mario Kart 8 and Mario Kart 8 Deluxe, the sponsors 1-Up Fuel and 1-Up Racing reference the 1-Up Mushroom, while the 1-Up Mushroom Car Insurance Group uses them both in its name and imagery. The 1-Up Mushroom only appears in Mario Superstar Baseball as an item that can be obtained through a slot in Toy Field. When the player acquires a 1-Up Mushroom, they can bat again, regardless if the fielders caught it or not. In Super Smash Bros. Brawl, the 1-Up Mushroom makes a cameo appearance as a sticker that can be equipped in the Subspace Emissary to Mario, Luigi, Peach, Yoshi, and Bowser. In Super Smash Bros. for Nintendo 3DS / Wii U, a 1-Up Mushroom appears as a trophy. In Fortune Street, a 1-Up Mushroom can be obtained through the Memory Block minigame. Once obtained, the 1-Up Mushroom increases all of the player's shop values by 10% each. In Mario Tennis Open, a 1-Up Mushroom trophy serves as the first cup in the Star Open tournament. In Paper Mario: Sticker Star, there are stickers called Big 1-UP and Big Shiny 1-UP, which restore a small portion of Mario's HP for 10 turns. In Paper Mario: Color Splash, there are 1-Up Mushroom cards that restore all of Mario's paint in battle instead of healing Mario. 1-Up Mushrooms proper also appear in their sprite forms in the Super Mario Bros. 3-styled level in the Green Energy Plant. They are found in ? Blocks, although they only restore a portion of Mario's paint. 1-Up Mushrooms also reappear in Captain Toad: Treasure Tracker, serving the same purpose as in other games. In Puzzle & Dragons: Super Mario Bros. Edition, the player will lose a life in a course when their team's total HP goes to zero. The player is then given an option to continue through the course or go back to the world map. Continuing through a course uses 1-Up Mushrooms, costing one per continue. When players lose all their lives, they go back to the world map and are automatically given four 1-Up Mushrooms. The player's maximum amount of 1-Up Mushrooms is 10. 1-Up Mushrooms can be found by opening ? Blocks in certain courses and can be won in the Lucky ? Blocks game at Toad Houses. The player may also earn them in a course by getting 12 combos. A 1-Up Mushroom is a space in Nintendo Monopoly. It replaces the Income Tax space. When a player lands on this space, they have to pay either 10% of their total assets or $200 in the 2006 version (just $200 in the 2010 version). In the Animal Crossing series, a 1-Up Mushroom appears as a furniture item, and when it is interacted with, it plays the extra life sound and causes "1-UP" to float above it (similarly to when one is collected in the series). In Animal Crossing: New Leaf, "1-Up" no longer floats above the 1-Up Mushroom when it is interacted with. In the Super Mario Mash-Up Pack in Minecraft, brown Mushrooms are replaced by 1-Up Mushrooms. In Mario + Rabbids Kingdom Battle, artwork of a 1-Up Mushroom can be found on a poster in the laboratory in the introductory cutscene. For this subject's image gallery, see Gallery:1-Up Mushroom. In Super Mario Land and its sequel, as well as Donkey Kong for the Game Boy, 1-Up Mushrooms are replaced with 1 UP Hearts. This is because the monochromatic screen of the Game Boy would make it impossible to tell 1-Up Mushrooms from Super Mushrooms. Even though the 1-Up Mushroom does not appear in the game Super Mario Odyssey, the sound effect does, as an Easter Egg. When the player pauses then unpauses the game, they will hear the 1-Up Mushroom sound effect. ↑ Super Mario Bros. 2 NES instruction booklet, page 19. ↑ 2.0 2.1 Super Mario World English instruction booklet, page 8. ↑ "If Fire Mario opens a door with a Super Mushroom behind it, the mushroom turns into TOAD, an Extra Mario Mushroom. He gives Mario an extra life." - Hotel Mario instruction book, page 11. This page was last edited on April 7, 2019, at 21:13.